I have been working with Python for the past 2 years. There are lots of tutorials available online that covers Python, but sometimes it doesn’t cover the most crucial part which needs an answer – “Why do we need to use Python?”. “Is it worth learning it?”. Since you have clicked this article, and reading till this point, I can assume that you are interested in Python or maybe you do know something about it but you need a quick recap. I am here to guide you not only with the syntax but also to tell some concepts, tips, and tricks associated with it. I have embedded the notebook in the article at the end. If you find trouble going through the code snippets in this article, you can refer to the notebook. I will be doing the same for the upcoming articles. It is a general-purpose, high-level, interpreted, dynamic scripting language. But, what is the difference between an interpreter and a compiler? That’s okay. But where do I use it? Cool. I guess we are good to go! If your ground is muddy, can you build your dream house? So, let’s make the basics STRONG! # This is how you comment a code in Python! ## Let’s start with the famous code. In order to get an understanding of these aphorisms, take a look at this link. ## some basic mathematical operations , I am not showing. You do it. But see this. which causes Python 2.7.X to adopt the behavior of 3.7.X! But what is this from stuff? We will look into it. But let’s cover Boolean operations. Variables do not have a defined type at compile time. Variables can reference any type of object! The variable type can change in run-time. Type checking is performed at run-time -> hence dynamic languages are slower than static languages. Everything in Python is an Object! Object mutability is defined by its type. Objects Are Never Explicitly Destroyed! Allocation and deletion are done by the interpreter. Python is structured in Modules. 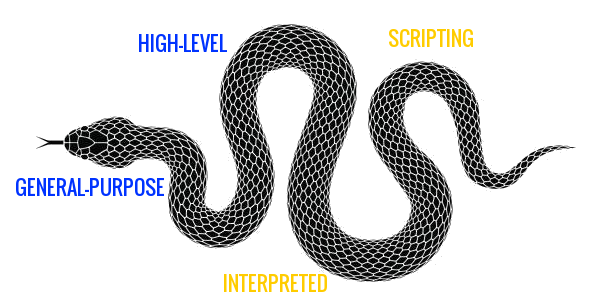 From these modules, it is possible to extend the python interpreter capabilities. sys -> System — specific parameters and functions. io -> Core tools for working with streams. os -> Miscellaneous operating system interfaces. threading -> Higher — level threading interface. multiprocess -> Process-based “threading“ interface. socket -> Low — level networking interface. asyncio -> Asynchronous I/O, event loop, coroutines, and tasks. cmd -> Support for line-oriented command interpreters. datetime -> Basic date and time types. time -> Time access and conversions. heapq -> Heap queue algorithm. queue -> A synchronized queue class. sqlite3 -> DB — API interface for SQLite3 Databases. Built-in functions are core functions, provided by the Python Interpreter. These functions are implemented in C and because of that, are capable of using and manipulating Python objects at memory level, with increased performance. Employee having ID No: 12345 is late for office today. Before going ahead, can you tell me the difference between a function and a method? Well, here is the answer. In C++, classes are not first class objects but instances of those classes are. In Python, both the classes and the objects are first class objects. Create your own functions using def keyword. UDF can either take or don’t take arguments. Technically, parameters are the variables in a function definition, and arguments are the values placed to the parameters when the function is called. The name of the UDF should be lowercase. *args and **kwargs allow one to pass a variable-length argument list and keyworded, variable-length argument dictionary respectively to a function when one doesn’t know beforehand how many arguments can be passed to the function. Not all variables are accessible from all parts of our program, and not all variables exist for the same amount of time. A scope is a textual region of a Python program where a namespace is directly accessible. A namespace is a mapping from names (variables) to objects. Basically, part of a program where a variable is accessible is its scope and the duration for which the variable exists its lifetime. Global: It is defined in the main body of a file, will be visible throughout the file, and also inside any file which imports that file. Local: it is defined inside a function, limiting its availability inside that function. It is accessible from the point at which it is defined until the end of the function and exists for as long as the function is executing. In Python 3, the third type of variable scope has been defined — nonlocal. It allows to assign variables in an outer, but non-global, scope. msg is declared in the outside function and assigned the value “Outside!”. Then, in the inside function, the value “Inside!” is assigned to it. When we run outside, msg has the value “Inside!” in the inside function, but retains the old value in the outside function. We see this behavior because Python hasn’t actually assigned the new value “Inside” to the existing msg variable, but has created a new variable called msg in the local scope of inside that shadows the name of the variable in the outer scope. Preventing that behavior is where the nonlocal keyword comes in. Now, by declaring nonlocal msg in the inside function, Python knows that when it sees an assignment to msg, it should assign to the variable from the immediate outer scope instead of declaring a new variable that shadows its name. The usage of nonlocal is very similar to that of global, except that the former is used for variables in immediate outer function scopes and the latter is used for the variable in the global scope. This is enough for the first part! I hope you guys have liked this article. We will meet in the 2nd part of this series. Why Python is called Python? Absolutely nothing to do with the snakes! It was named after this comedy group called Monty Python. When Guido van Rossum began implementing Python, he was also reading the published scripts from “Monty Python’s Flying Circus”, a BBC comedy series from the 1970s. Van Rossum thought he needed a name that was short, unique, and slightly mysterious, so he decided to call the language Python.